The featured image is my wee bedroom studio (well, how it was a few months ago – made a few upgrades since then). I spend a lot of time in here. And it’s pretty small as you can plainly see. But I’ve managed to build my own $5 easel system that can support a canvas of 48″x60′ rather well. Of course, navigating such a canvas into the bedroom through my narrow hallway is a submarine-like adventure, but it’s doable with colorful language. A few years ago they got into a fight that seemed destined to a bad ending. I had to stop it in a hurry so I doused Buffy with a big pot of water. That really cooled her jets before she did some serious damage to Shumi. Still made her little ear bleed though. What the heck? Anyway, Shumi lives in the front kitty-plex” comprising my kitchen & my living room (which is really about 80% art gallery). You can see my home art gallery in some of the art photos on my website “Perturbations” – displayed in my home gallery. Also, I have another studio painting space in that west side of kitty-plexia. It’s not quite usable now, but I see the need to get it up and running, again. I did most of my painting in it way back at the turn of the century. Probably you didn’t need to know a thing about it. But, I really wanted an excuse to type, TURN OF THE CENTURY!! 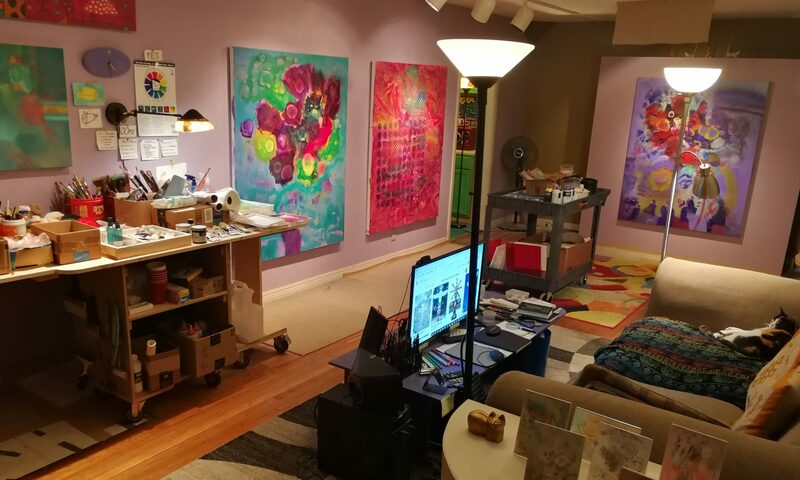 So, I have an unusual art studio arrangement. But my little cat family and I are having our little creative lives together in this place, for many years now. Could it be better? The salads are always crisper somewhere else – isn’t that how the old saying goes?